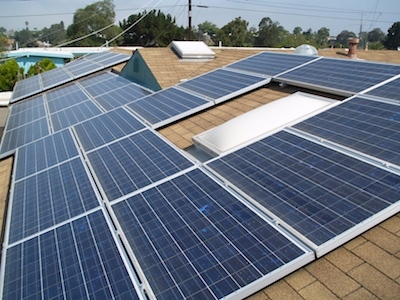 Given all the sunny weather in San Diego, solar power is an obvious option for electricity. In April 2004, four years ago from this writing, we had a rooftop system installed and it has been operating ever since. It was installed by Carlson Solar who not only did a great job of installing the system but also did all the paperwork to get the rebates and register the system with the power company. They also helped me figure out how large a system I needed from looking at my power bill. My system has 36 Sharp 165W solar modules and two SMA Sunny Boys. The system is rated 800kWh/month. It all fits easily on to the southwest facing portion of my roof. Of course the actual output depends on the angle of the installation to the sun and how much sun you get. The angle of our roof was good but not ideal – the modules could benefit from facing more south and the vertical angle isn’t quite right. There was some concern that since we are fairly close to the coast, the morning marine layer would reduce our output. After 4 years of operation I can now tell you that I have averaged 750 kWh/month. So the system has achieved 94% of maximum designed output. This is exactly what Carlson Solar predicted we would get from our installation. Good work Carlson Solar! The obvious use of a solar system is to make home energy independent. However, that would require storing electricity during the day for use at night with banks of batteries. 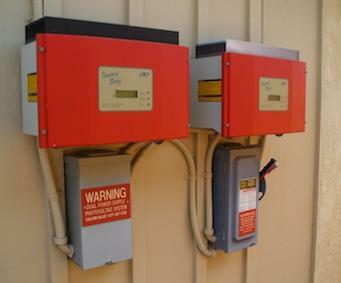 While this is possible, a simpler and more cost effective solution is to connect the system to the power grid through the use of an inverter. Our inverters are Sunny Boys and their purpose is to turn the DC solar-cell output into AC voltage and push the electricity onto the grid. This essentially means that during the day you power your house and also power your neighbors homes with the excess electricity. At night you take the electricity back off the grid. It also means that during the summer when you generate extra electricity, you can bank the extra on the grid for the winter when the days are shorter and you will generate less electricity than you use in a day. Left pointing arrow shows the meter is running backwards! To account for the banking of the excess electricity on the grid, our house uses net metering. During the day our meter runs backward and at night it runs forward. 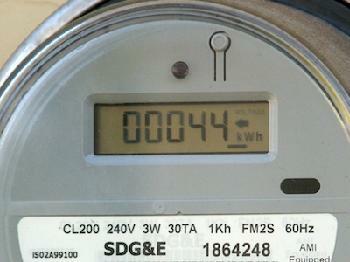 In the summer our total daily meter reading steadily goes backward as we generate excess electricity. During the winter it goes the other way as we use more electricity than we generate. The power company reads the meter once per year, and send us a bill for the year. So far that bill has been $0 as we generate a small net excess each year. Net metering requires no change to your electric meter – just an accounting change at the power company. We do get a small bill as we pay a minimal charge of $5.44 each month for the privilege of being connected to the grid. This is more than fair considering the huge advantage of being able to “bank” your excess electrons on the grid. Everyone wants to know how cost effective the solar system is and when it (or if) will pay off. So far my system has generated a total of 36,000 kWh (36 MW) of electricity in 4 years of operation. According to SDG&E’s website, the cost of electricity in San Diego is $0.154/kWh. Thus we have generated $5544 worth of electricity or $1386/yr. So the system will pay for itself in $19,000/($1386/yr) = 13.7 years. After this point for the rest of the system’s estimated 25-year lifetime, the system saves me money. So over 25 year lifetime of the system, I roughly double my investment. There are a lot of caveats to this calculation so it has to be taken with a grain of salt. First of all it doesn’t take into account a rise in the cost of electricity. I think we can safely assume it will go up – the question is how much will it go up. On the other hand, as the system ages it will produce less electricity as the cells slowly break down. If cost is really an issue for you, consider getting a system that generates about half of your electricity need over the year but will generate plenty on a hot, sunny day. If you change over to time-of-day metering you will be saving yourself from having to buy the more expensive summer afternoon electricity and instead using only the cheaper cool night electricity rates. Currently many people are paying $0.30/kWh to run their air conditioner. This would make the system pay for itself in half the time and have half the capital outlay. In spite of the economic advantages of the system, the main benefit I derive from the system is the feel good factor. This really surprised me. Even if the system wasn’t going to break even, I would do it again in a heartbeat. First of all it is really cool. The techie in me loves having the system – it is definitely among my favorite possessions. I love to watch the meter run backwards and watching the power displays on the Sunny Boys. The pioneer in me loves the fact that I am energy self-sufficient. The greenie in me loves the fact that I am reducing the carbon emission footprint of my household. The good citizen in me is content that I am helping out with the peak power problem and reducing the possibility of a rolling blackout. You might say that is a lot of money to feel good, but how many people do you know who spent the same amount of money to buy a Lexus or Mercedes instead of a more cost-effective Civic, just to feel good and impress the neighbors? That car will just last a few years and has no redeeming benefits to society. Obviously, the power company makes money by selling electricity. So if everyone converted to a rooftop solar system, there wouldn’t be any demand for their power. I doubt that will ever happen as most people aren’t going to make the investment for many reasons – but a big one is that you have to live in the same spot for many years (or move your solar system with you) to realize the benefit of your investment monetarily. However, the biggest problem for power companies is the fact that electricity use is not evenly distributed – the largest demand is on hot summer days when all the air conditioners kick in, and of course this is when the solar systems are producing the most. Power companies have to have enough capacity to meet the peak demand which is wasteful the rest of the year. Each solar system on the grid reduces the peak demand. In California there is an initiative to convert a million homes to solar to reduce the peak demand and avert the possibility of rolling blackouts that occurred in 2000 and 2005. We don’t do anything to maintain the system. Being up on the roof, the panels don’t get dirty and every once in a while some helpful rain washes the dirt off for us. I did once go up and wipe the modules with a duster and got an increase of about 0.5% for my trouble. So now I just monitor the numbers on the inverters. This all paid off this winter when I noticed the right inverter was putting out half of the left inverter when normally they are within a few percent of each other. We called Carlson Solar out and they quickly found the problem was some water that had leaked into a module’s wiring and produced a short. This was quickly remedied (for free under warranty) and the modules are back up and running. The problem had no real effect on our total generation as it happened in winter and was fixed in a few days.